In Creative Experiments to Drive Study Recruitment, we explored the ways to improve creative for better acquisition of study participants. Now, let’s look a little closer. “Online acquisition” is complex, and there are a lot of moving parts. But there’s a way to get a handle on the process, so you can lower cost per new participant and meet your ultimate goal—filling studies so they can move forward, on time and on budget. In this insight, I’ll talk about two ways to do this. The first is to focus on convincing your audience to act when asked. The second is to carefully choose the places where you share your content. When they develop creative, many organizations tend to focus on design: the images, the font choices, the colors and graphics. Those are all important. Text options, the written content, also plays a critical role. But in order to run a successful online recruitment campaign, it’s important that all these elements work together to get your audience to take a desired action. In preparing a campaign for Banner Alzheimer’s Institute’s Alzheimer’s Prevention Registry, Provoc prepared a number of creative approaches for testing. Although the approaches differed, they shared a common goal: to get site visitors to act. Our tests included imagery of people, illustrations of the brain, even simple, clickable graphics. We appealed to a variety of audience interests, including the desire to ignore Alzheimer’s and the concern for family members who might at some point acquire the disease. But we did more than just provide content that enabled visitors to learn more about Alzheimer’s and Banner Alzheimer’s Institute. We provided them with opportunities to take action. And we asked them directly to do so. 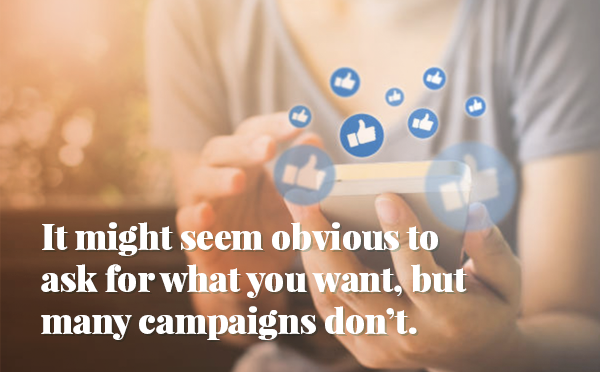 It might seem obvious to ask for what you want, but many campaigns don’t. We did, in a number of different ways. We asked people to take polls. We asked them to click an age range to get information suited to people their age. We asked people directly to click and sign up for the registry. We collected data on responses, dropped creative that didn’t work, and kept creative that did. Then we started another round. We created multiple versions of our most successful creative, tweaked it for improvements, and tested the results. As we did this, our creative focus improved. At the same time, we worked to hone our platform focus. Here’s what that looks like. In running a recruitment campaign, we have the choice of numerous places to share our creative: social media sites like Facebook, Twitter, and Instagram; search sites like Google, Bing, and Yahoo; advocacy sites such as AARP and Care2, and media sites such as Men’s Health, The New York Times, or Women’s Health. The range of options can seem daunting. We may have a sense of where our content might play best, but hunches can often be wrong. To improve platform focus, we need to test for what works where and analyze the data to go beyond intuition alone. For campaigns, we choose a number of placement options of varying cost and demographic reach. In a first engagement, we place and test creative, again focused on the target action we want: direct signup, or engagement with information that leads to sign up. Even more so than for creative, the results of our first round of platform testing can be quite striking, and show a clear champion. This can enable us to shift spending from less effective platforms for engagement 2. The result? Significant improvement—in fact, our research shows that online acquisition can cost as little as 1/20th as much as traditional methods. What makes the difference? A continual cycle of build, test, and improve to sharpen focus on both our creative and our platform choices. Want to know more about how you can use a focus on actions and platform efficiency? Reach out, and we’ll be glad to talk more. Meanwhile, stay tuned for our next Insight, “Building Better Content Through Data Analysis”.